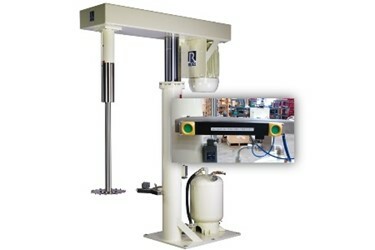 ROSS High Speed Dispersers now feature two-hand safety controls for raising and lowering the mixing head. The two-hand system requires two push buttons to be pressed and maintained to allow operation of the hydraulic lift, ensuring the operator’s hands are clear from contact with moving parts. The improved ROSS High Speed Disperser reflects the company’s commitment to the safety of its customers, minimizing hazards wherever possible. ROSS High Speed Dispersers are standard workhorses used throughout the process industries, primarily for incorporating powders into liquid. Running at tip speeds up to around 5,000 ft/min, the open disc blade of the High Speed Disperser generates vigorous flow and a characteristic vortex into which dry ingredients are added for quick wet-out. This classic mixer can handle product viscosities up to 50,000 centipoise. Popular sizes available from stock for immediate purchase or trial/rental.